with Professional Clinical Accuracy. Exclusive Four Multi-Color Screen - Fever Alert System and hard plastic white storage case. FDA Approved. ​Use at your Home, Work, Clinics, Schools, Hospitals or Day care. Q: Why does my temperature change? A: Normal body temperature not only varies between individuals, but also fluctuates within the same person depending on the time of day the temperature is taken - usually between 96.0°F and 100°F. You will find that different family members can have different readings depending on their age. Other factors can be things like taking the temperature from different parts of the body, the room temperature, have you just eaten or drank hot or cold items etc. These are all things that can affect your temperature and can cause differences. Q: Why is my thermometer only showing the blue screen? A: This is because you are in Room or Object mode. The Green, Yellow and Red screens are only active in Body Temperature Mode. Simply press the M button on your thermometer to switch between the two modes. Q: Is this a Fahrenheit thermometer or Celsius thermometer? A: Both! This thermometer is set for you to use out of the box in Fahrenheit mode. Although with a touch of the C/F button you can change this easily and instantly. Q: Can I get a copy online of the Information Manual? A: Yes! Simply register for your free product warranty extension and become a VIP to gain access. Q: Can the battery be replaced? If so, what kind? Q: Should I leave the batteries in my thermometer? A: It is recommended that when not being used for long periods of time that the batteries are removed. They can be stored safely and securely in your plastic storage case under the measure trigger. Q: What do I get in the package? batteries in your storage case too for long durations of non-use. • A clear, easy to follow plain English Instruction Manual. • 100% Customer satisfaction and Zoe+Ruth After Sales Service. • Access to the electronic quick guide PDF and Instruction Manual PDF's to get you moving. Q: Why if you say it is FDA approved - I can't see it on the box? 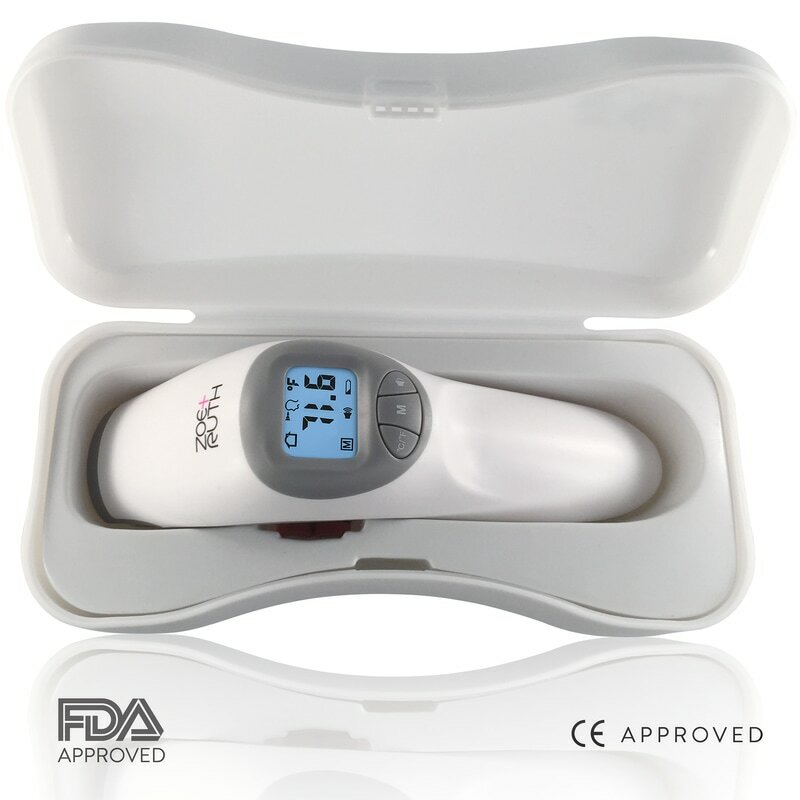 A: We always comply with FDA legislation and this Zoe+Ruth thermometer is FDA approved. We follow the strict guidelines set by the FDA. But we don't add the FDA logo to the packaging to follow FDA labelling legislation. 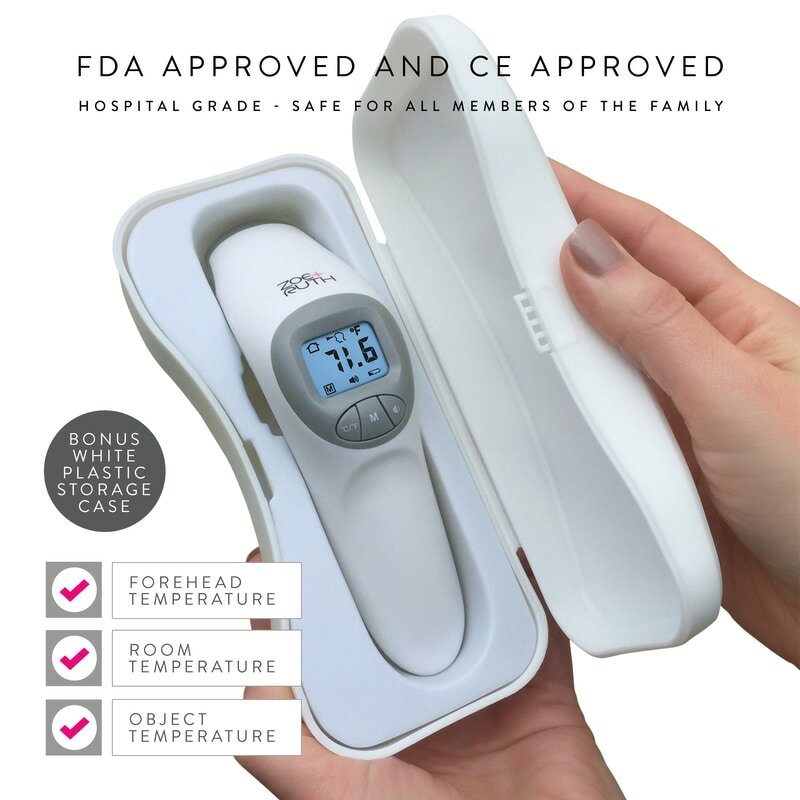 This Clinical Forehead Thermometer purchased from Zoe+Ruth comes with a 30 day money back guarantee. This manufacturer's warranty applies ONLY to purchases made from Zoe+Ruth.